The Matchmaker mobile app has been fully revamped with a slicker interface and more helpful information. 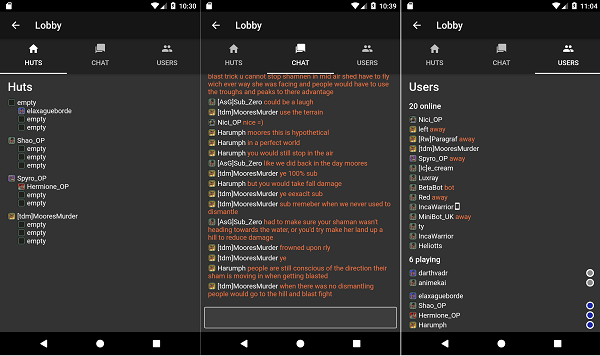 The app now shows the huts, users, game statuses, ranks, and more! The new Mobile App can be downloaded from the Google Play Store. A few changes to the leagues for Season 2. The distribution of ranks will be weighted more towards the lower ranks and Shaman rank will be limited to 10 players. There is also a new incentive to play for FireWarrior and Shaman level players - every day without a game played results in a loss of 2 points. Congratulations to Nici, Skylo, and Spinnifix for coming in at the top of the season 1 league. The full final results can be viewed on the Season 1 League Page. Were introducing seasons into the Populous league along side the standard long running league table. Season 1 will begin on July 1st and continue 3 months. Every quarter the new season will start. A player will have 30% of their difference in mu from the start, essentially compressing the league. Season 1 will use the the overall league as the previous season. Grades are going to be based on percentiles similar to how they were for the traditional league several years ago. Shaman Arena leagues have started! Play 10 Ranked Arena matches (2v2 or 4 players FFA) and your rank will be unlocked for the leagues table. So get your ally and battle 2 other players and make sure youre the last shaman standing! All images and map files on this site are © 2017 Populous: Reincarnated.